In memory of the 27 Dahlias and 5 sunflowers I have lost to the snotty, evil force that is slugs, today I'm 'growing' some mini sunflowers. I would like to start by saying I've not been put up to doing this post, the kit was a little present from Mum at last years KDF and I've taken ages to get round to making it! 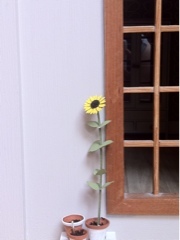 The sunflowers are actually from a kit by Bonnie Lavish at Templewood miniatures. Out of respect for her design I'm not going to give actual step by steps in how to make the flowers as it seems a bit cheeky? I rarely follow my own advice and today was no exception, read the instructions before you start! Before you start assembling anything SEAL the ends of the wires with tacky glue and let it dry. It DOES tell you to do this in the instructions. This is really important, I failed to do this and tore a lot of the little leaves trying to slip them onto the stem. Sob. If the wire's not coated, the green paper wrapped around it will unravel and make it impossible for you to assemble the flower. Just so you know. 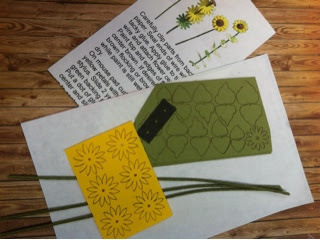 There's enough included in the kit to make three sunflowers. 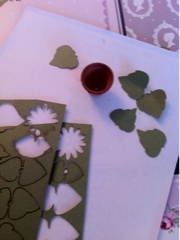 The petals and leaves are all pre-cut on thin sheets of paper and the wire is already coated in green to act as a stem. Following the steps from the kit I built up the flower head and petals before adding leaves in any order I liked. I can't lie to you, I've only finished one flower so far but it's taken pride of place on the door step of the newly decorated little house. For some extra detail I glued some tea sprinkles to the flower centre. Now I just need to slug proof the real garden and see if I can get something to stay alive. Before I go I want to say a big, big thank you for all the lovely comments and emails I've had since announcing four little walls.com! I'm genuinely very touched by how excited you've have been and the words of encouragement are VERY much appreciated!